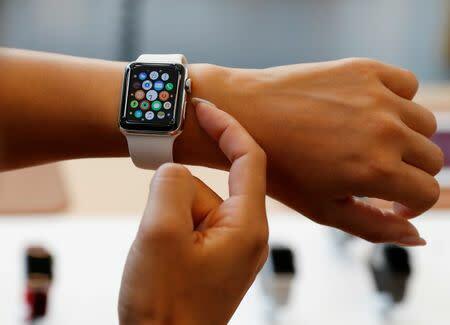 (Reuters) - The latest round of U.S. tariffs on $200 billion of Chinese goods could hit the Apple Watch, health trackers, streaming music speakers and other accessories assembled in China, government rulings on tariffs show. The rulings name Apple Inc's watch, several Fitbit Inc activity trackers and connected speakers from Sonos Inc. While consumer technology's biggest sellers such as mobile phones and laptops so far have faced little danger of import duties, the rulings show that gadget makers are unlikely to be spared altogether and may have to consider price hikes on products that millions of consumers use every day. The devices have all been determined by U.S. Customs and Border Patrol officials to fall under an obscure subheading of data transmission machines in the sprawling list of U.S. tariff codes. And that particular subheading is included in the more than 6,000 such codes in President Donald Trump's most recent round of proposed tariffs released earlier this month. That $200 billion list of tariffs is in a public comment period. But if the list goes into effect this fall, the products from Apple, Fitbit and Sonos could face a 10 percent tariff. The specific products listed in customs rulings are the original Apple Watch; Fitbit's Charge, Charge HR and Surge models; and Sonos's Play:3, Play:5 and SUB speakers. All three companies declined to comment on the proposed tariff list. But in its filing earlier this month to become a publicly traded company, Sonos said that "the imposition of tariffs and other trade barriers, as well as retaliatory trade measures, could require us to raise the prices of our products and harm our sales." The New York Times has reported that Trump told Apple CEO Tim Cook during a meeting in May that the U.S. government would not levy tariffs on iPhones assembled in China, citing a person familiar with the meeting. "The way the president has been using his trade authority, you have direct examples of him using his authority to target specific products and companies," said Sage Chandler, vice president for international trade policy at the Consumer Technology Association. The toll from tariffs on the gadget world's smaller product lines could be significant. Sonos and Fitbit do not break out individual product sales, but collectively they had $2.6 billion in revenue last year. Bernstein analyst Toni Sacconaghi estimates that the Apple Watch alone will bring in $9.9 billion in sales this year, though that estimate includes sales outside the United States that the tariff would not touch. It is possible that the products from Apple, Fitbit and Sonos no longer fall under tariff codes in the $200 billion list, trade experts said. The codes applied to specific products are only public knowledge because their makers asked regulators to rule on their proper classification. And some of the products have been replaced by newer models that could be classified differently. But if companies have products whose tariff codes are on the list, they have three options, experts said: Advocate to get the code dropped from the list during the public comment period, apply for an exclusion once tariffs go into effect, or try to have their products classified under a different code not on the list. The last option could prove difficult due to the thousands of codes covered, said one former U.S. trade official.